The rent at James Towne Village Apartments ranges from $1,123 for a one bedroom to a $1,448 two bedroom. Apartments in this building are about 6% less expensive than the Charleston average. This is a pet-friendly apartment. This apartment is in Charleston. 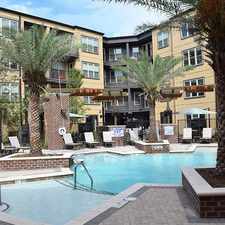 James Towne Village Apartments has a Walk Score of 53 out of 100. This location is Somewhat Walkable so some errands can be accomplished on foot. James Towne Village is the best kept secret on James Island. Not only do we have a new look on the outside but we have remodeled our kitchens with all new stainless appliances to include a built in microwave, self cleaning oven and an ice maker for every fridge. "Convenience" to everything you need is right on or around the corner. We are a 5 minutes drive to Downtown, 15 minute drive to Folly Beach and only 2 minutes from James Island County Park. Whether you just want to hang out by the pool, sit by the gas fire pit on a cool evening, take a break at the hammock station or even a ride to the park on one of our Complimentary bikes we can help you with that. Everyone loves it here! We are a Community that truly Cares, and this is what sets us apart. Our Staff lives the motto "because nice matters" and we mean it. Many long-term renters have Chosen to make James Towne Village their home year after year----the #1 reason we are not just a Complex: we are a Community. Cruise by to C us anytime. Explore how far you can travel by car, bus, bike and foot from James Towne Village Apartments. James Towne Village Apartments has minimal transit which means it is possible to get on a bus. View all Charleston apartments on a map. Search for homes in Charleston or find a Charleston real estate agent who knows walkable neighborhoods. Links will open on our partner site Redfin.com. James Towne Village Apartments is in the city of Charleston, SC. Charleston has an average Walk Score of 40 and has 120,083 residents.